Save on home improvement projects by buying a discounted Lowe's gift card. This works with other coupons and savings. 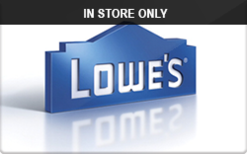 Lowes carries appliances, paint, patio furnitures, tools, floors, hardware, and many more. Chances are that you probably have one near you just like Home Depot. You can also buy a 10% off coupon on eBay which can be stacked with your gift card discount.